California offers ideal weather conditions for both nursery plant and strawberry fruit production. Variations in weather conditions in three strawberry production regions in California complement fruit production from each other and help avoid market glut. 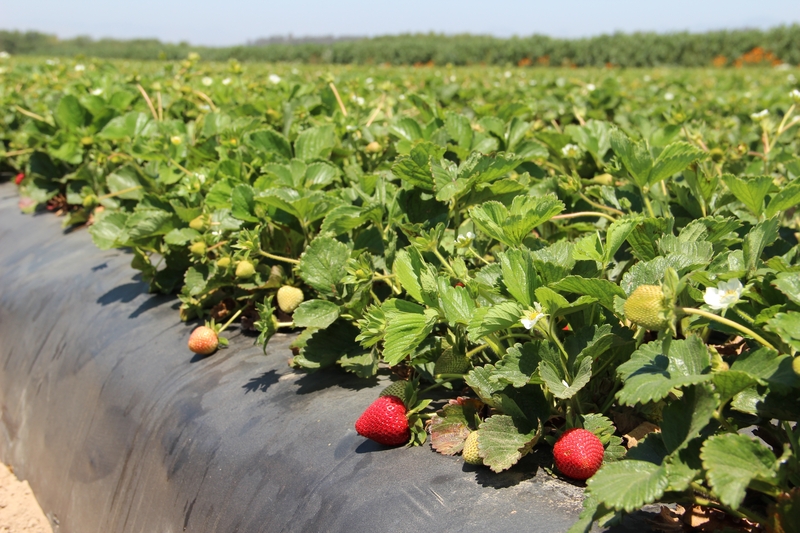 The warmer Oxnard area, the milder Santa Maria area, and the colder Watsonville area with minimal overlapping of their peak fruit production seasons allow yearlong strawberry production. Weather influences on strawberry have been well documented in various strawberry producing regions across the world (Palencia et al., 2013; Li et al., 2010; Waister et al., 1972). 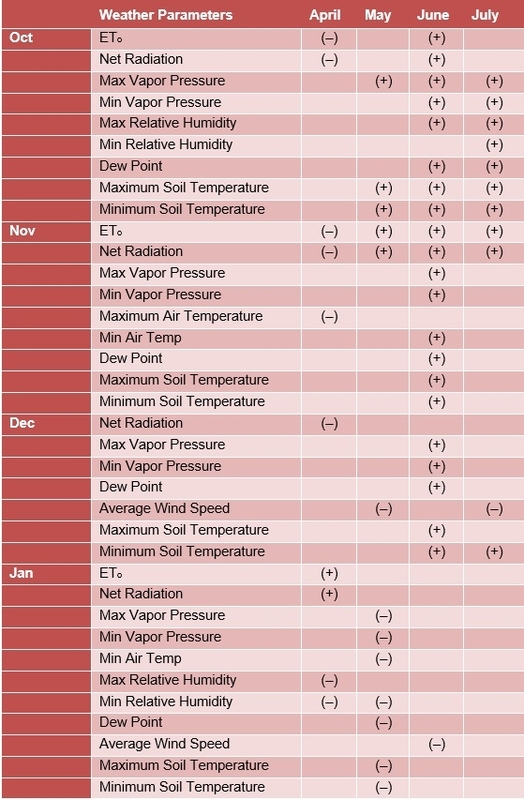 Examples of key weather parameters correlated with strawberry yield include temperature, precipitation, solar radiation, relative humidity, and wind speed. Crop growth is weather dependent, thus, it is a common practice to estimate fruit yield based on weather variables. Since strawberry production spreads across 4–5 months, evaluating relationships between meteorological parameters and strawberry yield can provide valuable information and early indications of yield estimations that growers can utilize to their advantage. Objective of this research was to evaluate correlations of meteorological parameters on strawberry yield for Santa Maria region and to develop weather based statistical yield forecasting models for strawberries. Daily strawberry yield data for the Santa Maria region was obtained from published sources (California Strawberry Commission). This information is publically available and is originally compiled from the United States Department of Agriculture Market News/Fruits & Vegetables website. Daily strawberry yield data for the month of April through July were aggregated to weekly values. For this analysis we used weekly strawberry yield data for 2009 through 2015. Weather data were obtained from the California Irrigation Management Information System (http://www.cimis.water.ca.gov/), a network of over 145 automated weather stations in California. Specific meteorological parameters used in this study were net radiation, air temperature (minimum and maximum), relative humidity (minimum and maximum), dew point temperature, soil temperature (minimum and maximum), vapor pressure (minimum and maximum), reference evapotranspiration, and average wind speed. Weekly values of meteorological parameters from October of the year prior to harvest to February of current year of strawberry harvest were correlated with weekly strawberry yield from April through July and tested for significance. Each meteorological variable was correlated with strawberry yields from April to July. This thorough correlation analysis was done in order to understand influence of meteorological parameters on strawberry yield on a more detailed basis. Fall and winter weather conditions during the vegetative growth period of strawberry have a significant influence on the fruit yields in the following spring and summer for the Santa Maria region. Results show that net radiation, relative humidity, vapor pressure, wind speed, and temperature showed significant correlations with strawberry yields at various temporal scales. In general, it was evident that many meteorological parameters during the early stages of strawberry growth and development phase exhibit statistically significant correlation with strawberry yields during the peak fruit production period. This finding is consistent with the findings of Lobell et al. (2006) for strawberry and other crops in California. Table 1. Correlation matrix of monthly meteorological parameters and strawberry yields that were statistically significant. Weather parameters that showed significant correlations were used to develop strawberry yield forecasting model. Instead of using weather parameters as explanatory variables, they were transformed into principal components to develop yield–forecasting models. 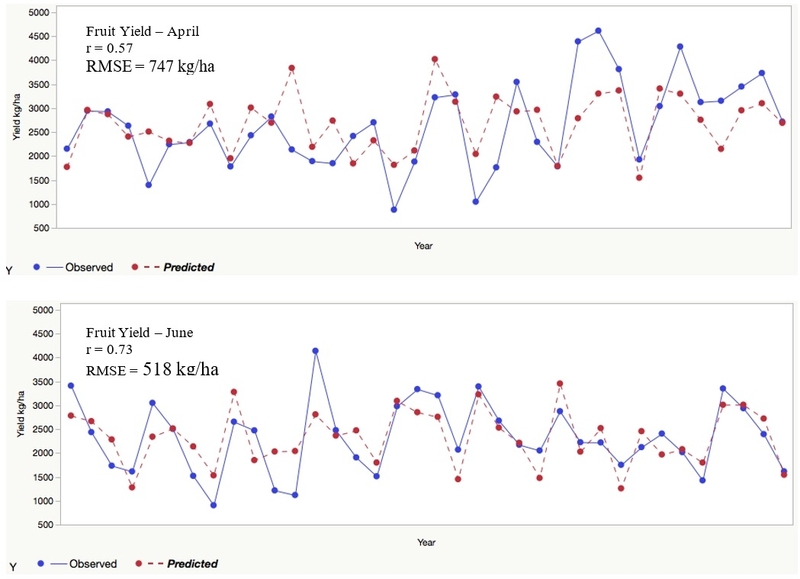 It is important to note that there are limitations on how much variability in yield data that can be explained by meteorological parameters as many other factors such as management practices, pests, diseases, varieties, other stress factors can also influence yield variability. Additionally, historic strawberry yield data provided an average estimate for the region and might not represent accurate observations. These results demonstrate the potential to predict strawberry yield using weather variables relevant to the Santa Maria strawberry growing region. In order to make these results usable for decision–making, it could be refined to be utilized at the field scale. Additionally, skills of these models can be further improved by combining weather parameters and relevant physiological parameters of strawberry at the field scale. Li, H., T. Li, R.J. Gordon, S.K. Asiedu, and K. Hu. 2010. Strawberry plant fruiting efficiency and its correlation with solar irradiance, temperature and reflectance water index variation. Environ. Exp. Bot. 68, 165–174. Waister, P. D. 1972. Wind as a limitation on the growth and yield of strawberries. hort. Sci. 47: 411 – 418. Lobell, D.B., K. Cahill, and C. Field. 2006. 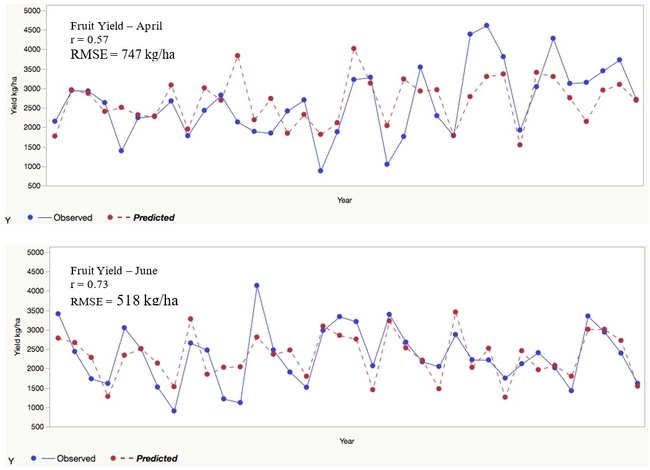 Weather–based yield forecasts developed for 12 California crops. California Agriculture, 60(4): 211–215.